Meet Sandman. Our handsome, ten year old fuzzy friend. He loves the outdoors, hunting, bird watching, and sleeping. He eats lap dogs for breakfast, despises big dogs, other cats, raccoons, and small children. Despite his best efforts, he has never caught a gray or a red squirrel. He has however dragged plenty of other critters into the house; chipmunks, mice, garter snakes, birds, and once even a flying squirrel. When I first flew out to Washington for a visit, Sandman and I hit it off immediately. However, after I moved in permanently, we fought a little tug of war over Ryan. Every time Ryan and I would sit down together, Sandman would squeeze himself in between the two of us and laid his paw on Ryan's leg, telling me Ryan was his. It didn't last very long. As soon as he realized he now had someone to keep him company during the day, he warmed up to me. We have been buddies ever since. His gorgeous long locks protect him from the elements in the colder months of the year, but can be a bit of a burden during the summer. Not only does he get very hot on the warmer days, his hair tangles to dreads, especially on his belly. And if you value your life and limbs, you keep the brush away from that belly. 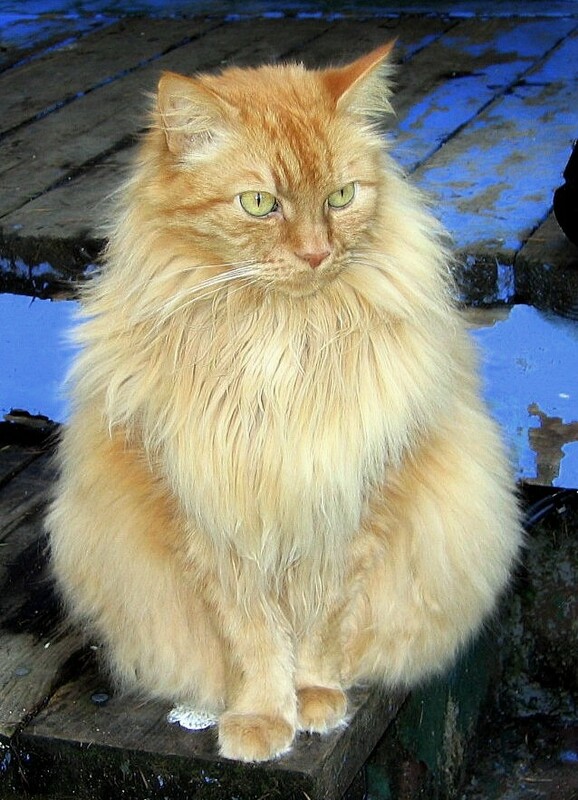 His fur is also a haven for fleas and lately, for ticks. The little buggers frequently hitch a ride in his pelt, sneaking their way into the house. The obvious answer to this problem is a haircut. Ryan had Sandman's hair cut once before, about five years ago, a buzz cut of his body. His head, tail, and paws were left untouched. 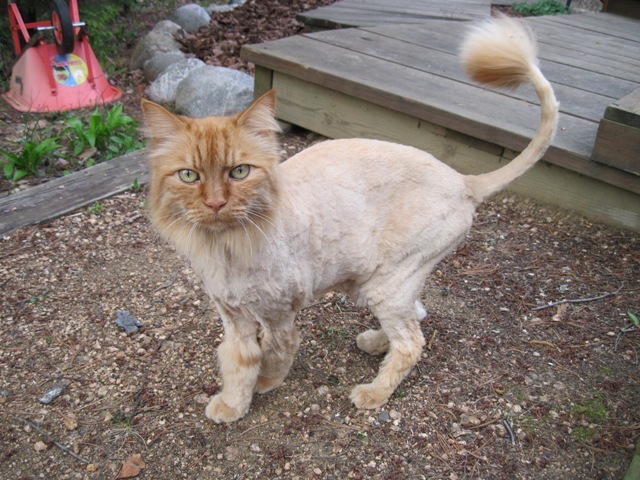 Evidently Sandman put up a bit of a fight, because the groomer never wanted to see him again. Last week things went very smooth. In addition to the haircut, he received a mani/pedi and a bath. 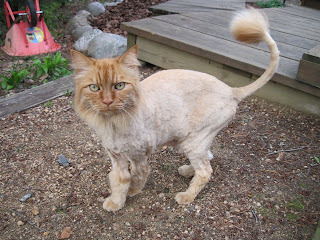 His groomer loved him, and took the haircut a step further than simply shaving his back and belly. It's a bit of a change, but he has never looked more dashing, albeit very skinny! To avoid any self consciousness on his part, we have given him lots of love and attention. He revels in it. I just love his tail! What do you think? That is way too funny. I love the suspense you built up in the story too.